The apology by CEO Mark Zuckerberg reiterates that Facebook has already stopped third-party apps from “getting so much information”. 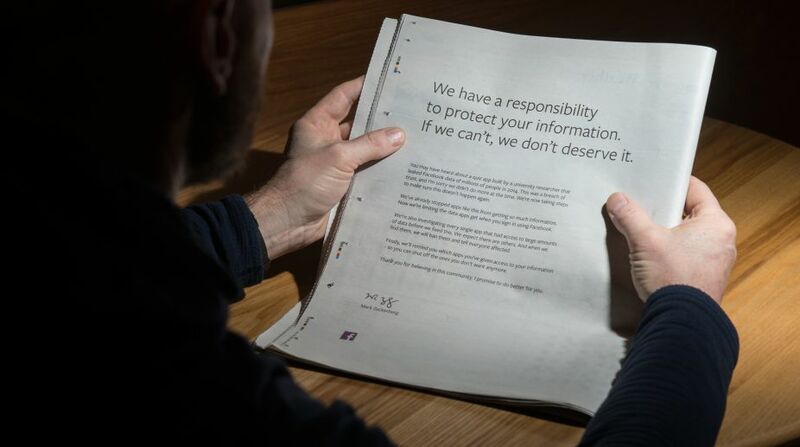 Facebook on Sunday took out full-page advertisements in at least 10 British and American newspapers to apologise for a huge data privacy scandal, without mentioning Cambridge Analytica, the British firm accused of using the data. The apology penned by Facebook CEO Mark Zuckerberg reiterates the company’s statement issued earlier that it has already stopped third-party apps from “getting so much information”. It also says Facebook has now started “limiting the data apps get when you sign up”, as announced by the company last week. The ads ran in prominent positions in British newspapers Mail on Sunday, The Sunday Times and The Observer, which helped break the story, besides New York Times, Washington Post and the Wall Street Journal in the US. A number of people tweeted the ad page on the micro-blogging site. The ad says little newer than what Zuckerberg said in his public statements made last week after the row prompted investigations in Europe and the US. Facebook’s share price had plunged following the controversy. He repeated that Facebook had changed the rules on apps so no such data breach could happen again. The apology does not mention Cambridge Analytica, which worked on US President Donald Trump’s 2016 campaign. Zuckerberg had earlier blamed University of Cambridge researcher Alexsandr Kogan for any potential breach of data rules. Kogan created a lifestyle quiz app for Facebook, which was downloaded by 270,000 people, but allowed access to tens of millions of their contacts. While Facebook has said Kogan passed this to Cambridge Analytica without its knowledge, the latter says he is being made a scapegoat. Sharing Mark Zuckerberg’s Facebook post addressing the Cambridge Analytica news earlier, Chief Operating Officer Sheryl Sandberg had also taken to Facebook regretting the breach. “We’ve spent the past few days working to get a fuller picture so we can stop this from happening again. Here are the steps we’re taking. We’re investigating all apps that had access to large amounts of information before we changed our platform in 2014 to dramatically reduce data access. And if we find that developers misused personally identifiable information, we’ll ban them from our platform and we’ll tell the people who were affected,” she had said. Sandberg had said Facebook was taking steps to “reduce the data you give an app when you use Facebook login to your name, profile photo, and email address”. “And we’ll make it easier for you to understand which apps you’ve allowed to access your data,” she posted.